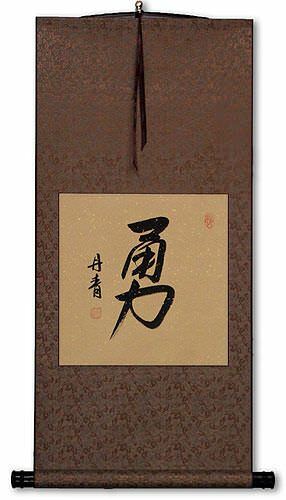 Buy a Courage in the Face of Fear calligraphy wall scroll here! 勇敢 is about courage is bravery in the face of fear. You do the right thing even when it is hard or scary. When you are courageous, you don't give up. You try new things. You admit mistakes. This kind of courage is the willingness to take action in the face of danger and peril. 勇敢 can also be translated as: braveness, valor, heroic, fearless, boldness, prowess, gallantry, audacity, daring, dauntless and/or courage in Japanese, Chinese, and Korean. This version of bravery/courage can be an adjective or a noun. The first character means bravery and courage by itself. The second character means "daring" by itself. The second character just emphasizes the meaning of the first but adds an idea that you are not afraid of taking a dare, and you are not afraid of danger. 勇敢 is about brave behavior versus the mental state of being brave. You'd more likely use this to say, "He fought courageously in the battle," rather than "He is very courageous." This proverb creates an image of a warrior bravely advancing against an enemy regardless of the odds. This proverb can also be translated as "indomitable spirit" or "march fearlessly onward." "Never hesitate to do what is right." 勇 can be translated as bravery, courage, valor, or fearless in Chinese, Japanese and Korean. 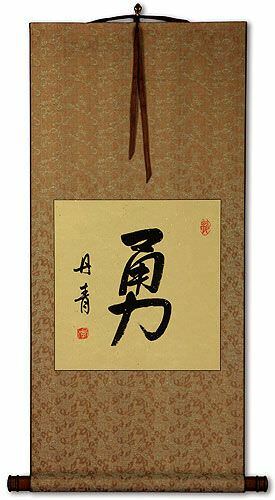 勇 is the simplest form to express courage or bravery, as there is also a two character form which starts with this same character. 勇 can also be translated as brave, daring, fearless, plucky or heroic. There are several ways to express bravery and courage in Chinese, Japanese, and Korean. This version is the most spiritual. 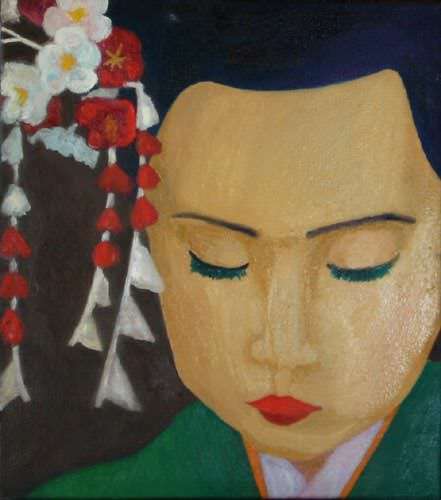 勇氣 is the essence of bravery from deep within your being. 勇氣 is the mental state of being brave versus actual brave behavior. You'd more likely use this to say, "He is very courageous," rather than "He fought courageously in the battle." The first character also means bravery or courage when it's seen alone. With the second character added, an element of energy or spirit is added. The second character is the same "chi" or "qi" energy that Kung Fu masters focus when they strike. For this reason, you could say this means "spirit of courage" or "brave spirit." 勇氣 is certainly a stronger word than just the first character alone. Beyond bravery or courage, dictionaries also translate this word as valor/valour, nerve, audacity, daring, pluck, plucky, gallantry, guts, gutsy and boldness. 勇氣 is also one of the 8 key concepts of tang soo do. While the version shown to the left is commonly used in Chinese and Korean Hanja (and ancient Japanese Kanji), please note that the second character is written with slightly fewer strokes in modern Japanese. If you want the modern Japanese version, please click on the character to the right. 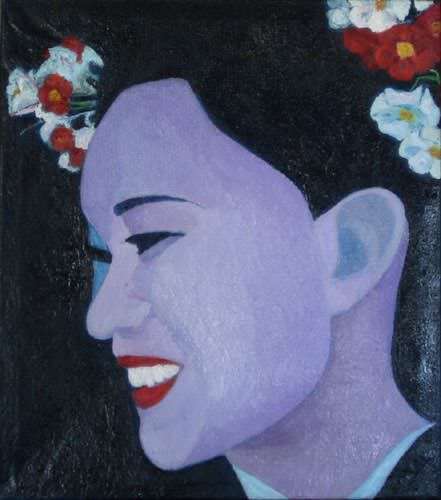 Both styles would be understood by native Chinese, Japanese, and many (but not all) Korean people. You should make your selection based on the intended audience for your calligraphy artwork. Or pick the single-character form of bravery/courage which is universal. This literally means "fear nothing" but it's the closest thing in Chinese to the phrase "fear no man" which many of you have requested. This would also be the way to say "fear nobody" and can also be translated simply as "undaunted." 大膽不敵 is a Japanese word that can mean a few things depending on how you read it. Popular translations include fearless; audacity (the attitude of a) daredevil, daring. 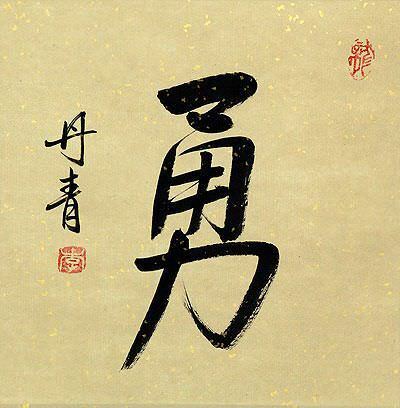 The first two Kanji create a word that means: bold; fearless; daring; audacious. The last two Kanji create a word that means: no match for; cannot beat; daring; fearless; intrepid; bold; tough. As with many Japanese words, the two similar-meaning words work together to multiple the meaning and intensity of the whole 4-Kanji word. Honor does not allow one to glance back. Duty-bound not to turn back. To pursue justice with no second thoughts. This proverb is really about having the courage to do what is right without questioning your decision to take the right and just course. This literally means "No Fear." But perhaps not the most natural Chinese phrase (see our other "No Fear" phrase for a more complete thought). However, this two-character version of "No Fear" seems to be a very popular way to translate this into Chinese, when we checked Chinese Google. Note: This also means "No Fear" in Japanese and Korean but this character pair is not often used in Japan or Korea. This term appears in various Chinese dictionaries with definitions like "without fear," intrepidity, fearless, dauntless, and bold. In Buddhist context, this is a word derived from abhaya meaning: Fearless, dauntless, secure, nothing and nobody to fear. Also from vīra meaning: courageous, bold. 恐れず is probably the best way to express "No Fear" in Japanese. The first Kanji and following Hiragana character create a word that means: to fear, to be afraid of, frightened, or terrified. The last Hiragana character serves to modify and negate the first word (put it in negative form). Basically, they carry a meaning like "without" or "keeping away." 恐れず is almost like the English modifier "-less." Altogether, you get something like, "Without Fear" or "Fearless." Translation: She is not scared of taking big risks. This really means, "When you are well-prepared, you have nothing to fear." Noting that the third character means "no" or "without" and modifies the last... The last character can mean misfortune, troubles, worries, or fears. It could even be stretched to mean sickness. Therefore you can translate this proverb a few ways. I've also seen it translated as "Preparedness forestalls calamities." 有備無患 is comparable to the English idiom, "Better safe than sorry" but does not directly/literally mean this. This proverb means, "When you are well-prepared, you have nothing regret" in Japanese. Some people may refer to this entry as Courage in the Face of Fear Kanji, Courage in the Face of Fear Characters, Courage in the Face of Fear in Mandarin Chinese, Courage in the Face of Fear Characters, Courage in the Face of Fear in Chinese Writing, Courage in the Face of Fear in Japanese Writing, Courage in the Face of Fear in Asian Writing, Courage in the Face of Fear Ideograms, Chinese Courage in the Face of Fear symbols, Courage in the Face of Fear Hieroglyphics, Courage in the Face of Fear Glyphs, Courage in the Face of Fear in Chinese Letters, Courage in the Face of Fear Hanzi, Courage in the Face of Fear in Japanese Kanji, Courage in the Face of Fear Pictograms, Courage in the Face of Fear in the Chinese Written-Language, or Courage in the Face of Fear in the Japanese Written-Language. 31 people have searched for Courage in the Face of Fear in Chinese or Japanese in the past year.